Canada leads the developed world in per capita production of garbage. What's behind our nation's wasteful ways? On the morning of May 3, 2016, at the Canada Fibers plant on Arrow Road in northwest Toronto, a worker spotted something abnormal and quickly sounded the alarm. 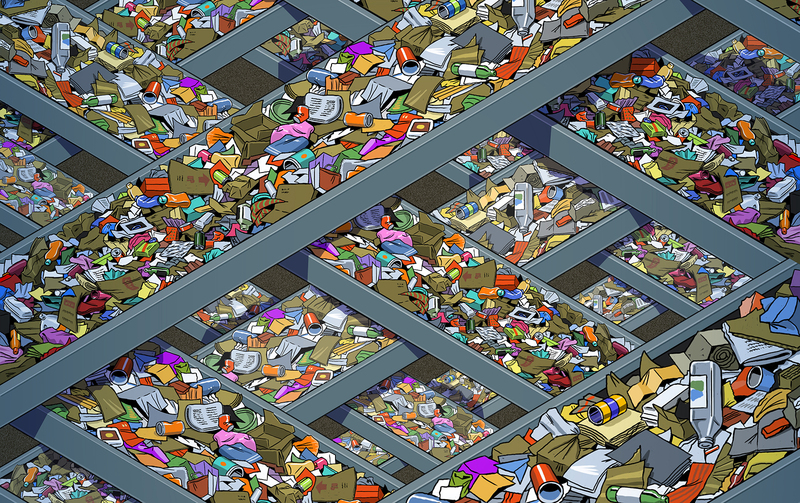 The cavernous echoing facility is the separation site for the 800 tonnes of “recyclables” that Toronto's waste management department collects daily from blue bags and bins around the city. As the impressive tonnage rattles and roars through the plant, high-tech machinery winnows steel cans from aluminum cans, from glass, from paper, from cardboard, from Styrofoam, from numerous other kinds of plastic. The mountains of separated detritus are then compressed into bales the size of pianos, and are shipped off to buyers... who break them down and sell them to manufacturers ... who build them up again and sell them to consumers ... who break them down again, and put them in recycle bins, from which they are picked up by one of the 800 curbside collection trucks used by the city; and the whole surreal process begins again ... and then begins again. But all of this went kerflooey on May 3, when the machinery at Arrow Road failed to recognize and “sort” what police later described as “a human body part.” Within minutes, the rumbling of the plant came to a halt, and the site was summarily shut down. And remained so for some 24 hours. For Derek Angove, the city's amiable and devoted director of solid waste management, the problem was not so much the macabre presence of the body part (decidedly a matter for the police) but rather that for an indefinite period of time the plant would be out of commission, and there would be no place to unload or winnow the never-ending avalanche of recyclables that pours into the facility at a rate of about two tonnes a minute, aboard 18-wheelers that pick up the goods from any of seven municipal transfer stations across the city. In a world increasingly inclined toward “suicide by garbage,” as the late American novelist Jim Harrison phrased it, Toronto might seem to be a mere whistle stop on the road to global self-destruction. The last time Torontonians glimpsed the realities of their garbage habit was during the five-week municipal workers' strike in 2009, when many of the city's parks and outdoor rinks (devoid of ice in July) were buried up to four metres deep in stinking refuse. The previous glimpse came after 9/11, when U.S. border authorities temporarily stopped shipments of about a thousand tonnes per day of Toronto's garbage to the Carleton Farms landfill in Michigan. At the time, another 4,000 tons of the city's trash was being deposited daily in the Keele Valley landfill, Canada's largest garbage dump, just north of Toronto in Vaughan — a site that was itself under pressure and about to close its drawbridge on Toronto's daily outpouring of rubbish. Any outsider granted a behind-the-scenes peek at that outpouring is likely to be struck by its volume and variety and cost – more than a million dollars a day to keep it all moving. But what really hits the uninitiated, and hits hard, is the flow of it all, the river — the nightmarish relentlessness with which the waste keeps coming, keeps needing a place to go, to hide, to die, sometimes to be reborn. All of which echoes the relentlessness of the country's garbage production as a whole. Despite what anyone might believe about the country's oft-cited ecological values and its liberal ambitions for the planet, Canada leads the developed world in per capita production of garbage. What really hits the uninitiated is the flow of it all — the nightmarish relentlessness with which the waste keeps coming, keeps needing a place to go, to hide, to die, sometimes to be reborn. The 720 kilos per capita of waste produced annually by every Canadian is about twice what is produced per capita in Japan, and as much as 10 times what is produced by a half-dozen countries in Africa. More alarmingly, our production is seven per cent higher than per capita ouput of waste in the United States, which all but invented consumer excess. Beyond the city's annual processing of 200,000 tonnes of recyclables, its residents produce household garbage (the stuff we put in green bags) at a rate of 10,000 tonnes a week, or half a million tonnes a year. For maximum efficiency, tractor trailers, each bearing nearly 40 tonnes of compacted garbage, are meticulously clocked out of Toronto so as to arrive at the city's Green Lane landfill near London, Ont. at a rate of one every 10 minutes, hour by hour, weekday after weekday. Relative to most rural settings in southwestern Ontario, and despite its pastoral name, Green Lane is not so much a parcel of land, or even a dump in any typical sense, as another planet. Located just north of Highway 401, about 200 kilometres west of Toronto, the 130-hectare public landfill (Canada's biggest) throws a memorable pong across the surrounding countryside but is otherwise barely discernible to anyone who does not actively seek it out. A grassy berm separates it from the 401, and the side road to the site passes a hardwood forest and creek remediated by the City of Toronto, in part as a kind of thank-you to Southwold Township for taking on Toronto's garbage at a time when other constituencies wanted nothing to do with it. The landfill's relatively dressy exterior is significantly influenced by its manager, Anne Hiscock, a lawyer turned engineer whose office, on the site's north side, is in a faux-residential building surrounded by a riot of yellow gardens that, a year ago, earned the site a place on the local Communities-in-Bloom tour. However, as Angove and Hiscock accompany a first-time visitor up the long ramp to the lip of the landfill proper, Angove offers a gentle caution about what lies ahead: an experience perhaps unimagined, or even unimaginable. And he is well-justified in doing so. The visitor and his chaperones come over the last incline in the road, out onto a dusty mesa from which the valley beyond might be mistaken for a vast archaeological dig, one that has unearthed a somehow familiar civilization, or more precisely what remains of that civilization when it bags up the leftovers from its pillaging of the planet and tosses the bags into an 11-million-cubic-metre hole. Seeing the place for the first time is a moment for which no convenient hyperbole is too big (think Cortez, gazing at the Pacific, “silent on a peak in Darien,” as John Keats put it). Except that the ocean here is not of course water but garbage, fathoms of it, a sea on which 18-wheelers and Caterpillar landfill compactors move about like small ships, the sound of their engines silenced by distance and the persistent howl of the wind. Typically, such a place would be host to legions of scavenging birds (Vancouver's Ladner landfill, at Delta, hosts several thousand gulls and a thousand bald eagles). But on this day at Green Lane there are just two birds – rentals, of all things – both perched on the viewing promontory: an aging golden eagle and a Harris hawk, a kind of missile with wings, that Angove says is “the work horse” of the pair. Green Lane hires the tamed raptors from Predator Bird Services to come and sit by the site on perches, within metres of their handler's vehicle. From there, the hawk takes an occasional tour over the garbage, to remind gulls that the landfill is not the paradise they might have assumed (the old eagle is more of an implied threat these days). “So, we have no birds,” says Hiscock. And no rats. And no bears. Green Lane, like all landfills, does have a hellacious population of microbes, quintillions of them, that eat away at the dump's contents, producing methane gas, a serious greenhouse offender, at a rate of 96 cubic metres per minute (enough to fill a two-car garage nearly 1,500 times a day). The gas is collected by dozens of vertical and horizontal gas wells and is burned off or “flared,” although plans are proceeding to construct a power plant that will convert the methane to usable energy. At Keele Valley, Toronto's former landfill, which was decommissioned 16 years ago, methane still pours from the buried trash in sufficient volume to fuel a plant that provides enough electricity to supply 20,000 homes. A natural clay underlay at Green Lane prevents toxic leachate from getting into the groundwater. “We know the clay is impenetrable,” says Angove. “Tests showed water molecules just above it that dated back 10,000 years” — in other words to a time when the last of the Wisconsin glaciers was dragging its icy tail across the territory. Unlike some landfills that are open for a specified period of time and then are closed, Green Lane will be a player until the last bag of chemically contaminated lawn cuttings and busted Barbie dolls is rammed into it by a 60-tonne bulldozer. The facility's closing date may be as far away as 2040, depending on Toronto's ongoing attempts to divert ever-greater quantities of its garbage away from landfill and into recycling. At the moment, the city diverts 52 per cent of the waste it collects into recycling (compared with, say, 34 per cent for Calgary and an average of 55 per cent in many Canadian cities). Canada is home to about 2,400 active landfills (large and small, public and private). Most of them stink; some leak chemicals and heavy metals into the ground and water table; some are prone to rats, some to fires; most create unwelcome truck traffic and dust. For perhaps obvious reasons, most are also politically contentious, particularly in the planning stages. Toronto negotiated for years to achieve its 2007 purchase of Green Lane, originally a private landfill that the city rebuilt and reopened for its own purposes in 2011. Prior to that, a decade of fractious negotiation went into the city's unsuccessful campaign to convert an abandoned mine near Kirkland Lake into its official trash hole. “Landfills are extremely difficult to locate,” says Angove, “and they should be, given their role and significance in the culture.” A number of Canadian cities, including Ottawa, Halifax and Vancouver, have in recent years witnessed strident debates over the siting of local landfills. Meanwhile, the stench and toxicity and flaring, as well as the truck traffic and expense and socio-ecological disruption, are the good news about Canada's waste and waste management efforts. The bad news is a succession of inconvenient truths sufficiently disconcerting to send all but the most resolute ecologists swimming for the bottom. 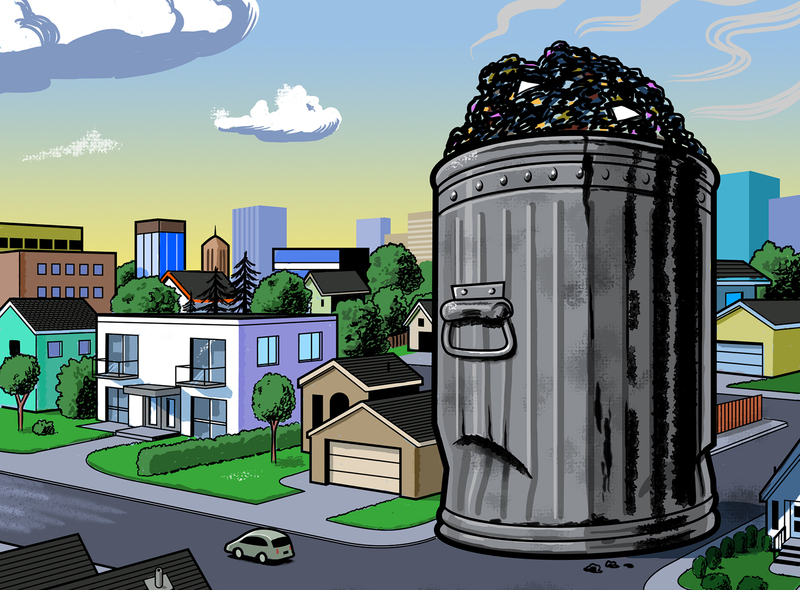 Those truths begin with an awareness that in Toronto, for example, and in other cities, residential waste — basically, all of the rubbish discussed above, including recyclables — makes up a little more than a third of total urban waste. The other two thirds comes from industry, commerce and institutions — ICI, in the parlance of waste management — which is to say restaurants, schools, malls, factories, and office buildings, as well as construction and demolition sites. “And on this stuff, we're much more in the dark than we are on household garbage,” says Myra Hird. For one thing, ICI waste is collected not by municipalities, which tend to run responsible programs, but by private waste haulers that, research has shown, divert only 13 per cent of what they collect into recycling, while the rest goes into private landfills or incinerators. Asked why the government doesn't force mine owners to comply with remediation laws, Hird responds that there are 28,000 mine sites in Canada that have no owners – that have been abandoned by companies that took all they could from a mine and then declared bankruptcy or simply fled. As an example of the worst, she sites the Giant gold mine near Yellowknife, where waste containing a quarter-million tonnes of deadly arsenic trioxide has simply been frozen in an attempt to limit further contamination. “They may have stanched the problem temporarily,” says Hird. “But all they're really doing is passing it along to future generations.” Hird contends that agriculture in Canada is as guilty as mining of creating and spreading waste, mainly sewage containing nitrates, hormones and medications that leach into the water table and on into lakes and rivers. Recycling itself can be an elusive factor in waste management. Studies indicate that in the United States more than 90 per cent of plastic, including much that goes into blue boxes, is never recycled. A news story from mid-2016 revealed that Tim Hortons, while inviting customers to place their disposable coffee cups in recycling containers, was not in fact recycling the cups in most parts of Canada, but merely sending them to landfills (the cups have a thin plastic lining that prevents them from joining the paper stream in many recycling programs). Estimates suggest that Canadians use between 1.6 and 2 billion disposable coffee cups a year. These represent up to 35,000 tonnes of paper, made from more than 70,000 tonnes of raw wood, harvested from thousands of hectares of forest. “So much for preserving your resources,” says Hoornweg. Electronics equipment made its slow way from the university's loading docks to landfills in India and Mexico. When people think their stuff is being recycled, it clears their conscience, no matter what is actually happening beyond the blue box. Amidst what one social critic called “the garbage nightmare,” it is difficult to imagine a future in which even cities with the most efficient waste management programs will eventually need no landfills at all. But in many municipal waste departments, zero garbage — zero landfill — has become a kind of scriptural mantra and ambition: Thou shalt not dump. “SOLID WASTE – OUR HIDDEN TREASURE,” proclaims a brochure published by Toronto's waste management department. The department's hope is that at some point, perhaps just 20 years away, every bit of the residential waste it collects will have a use, a buyer, a life beyond the garbage bag or blue box. The plan, if realized, would render a landfill such as Green Lane redundant. With the goal of total reclamation, the City of Toronto is making no plans at the moment to acquire property for its next landfill, which typically it would be doing at this point. Meanwhile, even a small city such as Whitehorse, where recycling is in its infancy, hopes to have a use for every trace of its solid waste by 2040. Hird notes that recycling in the form of “urban mining” may indeed reduce some of the world's existing waste. She cites Swedish research showing that “there is as much valuable metal in defunct infrastructure beneath our cities as there is in many of the world's mines.” With resources running out at traditional mine sites, new possibilities exist for recovering buried resources from their urban tombs. Landfills, too, shelter valuable metals and minerals, except that “mining” them puts at risk the impermeable barriers that prevent leachate from getting into groundwater and soil. While acknowledging that recycling is still a meaningful front-line strategy for reducing solid waste, Hoornweg is adamant that the ultimate cure for waste lies not at the “back end,” in recycling, but in reducing “front end” consumerism. Hird points out that economic boom times are invariably accompanied by increases in garbage. The coefficiency is born out in Toronto, where the surge in wealth in recent years has increased the city's output of solid waste (“tear-downs” are a prime example). On the contrary, Calgary's recent economic shrinkage has resulted in a significantly reduced output of waste – to a point where 29 jobs at the city landfill were recently eliminated (not enough work to keep employees busy), and the site's hours of operation were reduced by a day a week. Hird is asked point blank if, in their agonizing over waste, those who care are perhaps merely fretting over a situation that has already gone too far. An interviewer suggests jokingly that maybe an alien species will arrive and take us all to a splendid new planet. Meanwhile back in Toronto, it is six in the morning. Eight hundred waste collection vehicles are already on the streets — emptying green bins, gathering garbage, collecting bottles, cans and newspapers. At Green Lane, the first 18-wheeler has arrived with its 37 tonnes of rubbish. On the landfill's sea of rotting garbage, the Caterpillars are roaring, the methane is spinning into the wells. By 7, the Canada Fibers plant on Arrow Road is rumbling with beer cans and ketchup bottles. The transfer stations are all but bursting. By 9:30, the malls are open. The first wave of shoppers moves purposefully toward the televisions and yoga pants and electronic gadgetry. And lawn ornaments and fleece blankets and revolutionary new kitchenware. Because retail therapy is easier and less costly than planetary therapy. Some of the shoppers, it must be acknowledged, have brought their own tote bags. Others are conscientious about asking for a ceramic mug instead of a disposable coffee cup. Some drink at the public fountain rather than buying another plastic bottle of water. Because the planet must be saved.